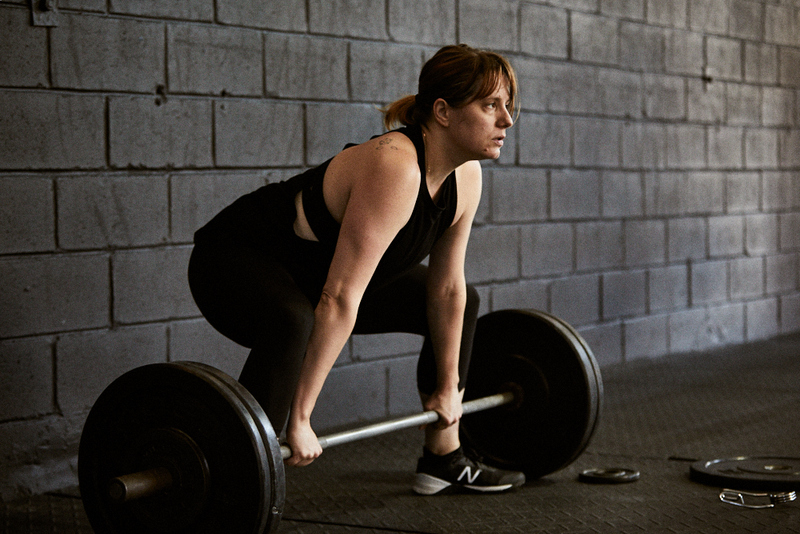 An avid runner, Leslie Grisdale used to jog past CrossFit 718’s open garage door and wonder what was up with all the crazy people throwing medicine balls and swinging kettlebells. Ten months ago, her curiosity got the best of her and, before she could say AMRAP, she became one of those crazy people (case in point: she actually likes thrusters). CrossFit proves to be a great complement to Leslie’s running and yoga practice, and Leslie proves to be a great addition to the 718 community! Read our Q&A with Leslie and get to know October’s Athlete of the Month! I’ve lived in Sunset Park for four years, and 3rd Ave. has been a part of my regular running route. I’d always run by and wonder what those crazy people were doing in there. Now I am one of those crazy people! I’m a longtime runner and yogi and am used to using my body in a certain way. Crossfit really challenges everything I know about exercise and my body, and it feels great! Also, the community, the coaches, and the friends at 718 can’t be beat! The list is endless, but the biggest is it has really helped with my stress level. I work in events and it turns out putting on parties is pretty stressful! CrossFit gives me an excuse to walk away for a while, get out of my head, and sweat with some friends. Well, luckily I work down the street at Industry City and I live in Sunset Park. I really don’t have many excuses not too! I always enjoy a good wall ball, and I love me some back squats. My dirty secret is that I also kind of like thrusters. Don’t get me wrong, after a few I feel like I’m going to die, but I really like the flow of the movement. I recently got the hang of kipping and that felt pretty great. My double unders are coming along as well. Also, being athlete of the month! Pretty much anything involving my upper body. I’ve been consistently working on my pull-up progression but I’m not quite there yet. I dream of doing a handstand but being upside down is something I have yet to master. I manage the staffing and logistics for a creative event company call David Stark Design. We are located in Industry City, and I work in our fabrication studio. We do lots of crazy stuff like build 6′ tall popsicles and put on bar mitzvahs at CitiField. You may have seen our truck driving down 3rd Ave.! When not working, I love all things food and am usually in the kitchen. I also love getting out to art galleries and comedy shows.